They have a TV commercial with local valedictorians here. Literally all I had to do was turn and smile, but I had panic attacks for DAYS. Which only got worse when the commercial started airing and I would randomly have to see it while watching Jeopardy. My parent’s still have the commercial saved on their Tivo, so I need to keep a stockpile of these muffins for when they’re feeling nostalgic/want to see me drenched in cold sweat. Oh my gosh, hilarious! 🙂 Glad I’m not alone in my anxiousness! please follow me on http://worldtravel.destinacijeusrbiji.rs/ i need help to be succesful like you… greetins! and thanks! It’s my favorite one just because it’s old. And makes huge muffins. That’s also a perk. Have a GREAT time tomorrow! Try to enjoy it!! Oh I would love to be your neighbor! I’m down with comfy pants and messy hair while shoving these muffins in my face! Oh thank you. I’m going to be needing apples recipes. The little farm we just bought has a little orchard with a bunch of apples trees. The previous owner came by the other day (delightful elderly man) and was telling me what type of fruit each tree was. Whenever I asked “When is the harvest” for every apple tree he kept saying “October”. I’m up to my eyeballs right now in tomatoes and pears and apparently I’ll be up to my eyeballs in apples when October gets here. Keep the apple (and pumpkin, don’t ask me how many of those I have) recipes coming. Ooh how exciting! I’m sure you guys will be great and lets face it – any sort of stuttering or ‘um’s will go completely unnoticed because you’re making all sorts of delicious kitchen magic with pumpkin and that’s enough to distract ANYONE at this time of year, right!? Thanks for the reminder about Food Blogger Pro – I’ve had a tab open for it in my browser for at least a week and I keep meaning to go back and read more! This is a beautiful recipe but I noticed that you listed the calories for 12 muffins when the photos are actually for 6 muffins. So when I make these, I will only be getting half of the size pictured for that amount of calories? Don’t you think that’s a little misleading? I would prefer to see the calories for exactly what’s pictured in the future, thanks! Hi Sally, I prefer to make them into 6 because I like a huge big muffin (knowing that, for mine, they would contain double the calories), but I just assumed that most people would prefer to make it into 12 which is the average size, which is why I put the directions and nutrition that way. Thank you for your feedback. LOVE the looks of this. Muffins are so much more practical than breads, I find, because they are pre-portioned. Good luck tomorrow!! Just made these for breakfast before work and my boyfriend came home and consumed one the minute after he stepped through the door. I wanted to thump him on the head, but he did say these were absolutely delicious. I’ve been sneaking bites here and there and they’re pretty amazing. Thank you for the awesome recipe! So glad you liked them! Thanks Sherry! This recipe sounds awesome for a rainy day! Yum. I just made these this afternoon and I don’t know what I did wrong but they taste like…nothing. They are so bland and yucky I’m getting ready to throw them out. Is there supposed to be cinnamon in the batter? Maybe that would help, but I don’t know. Shoot! Sorry to hear that Meghann. I am not sure what could have gone wrong – did you use the allspice? That should add a little kick of cinnamon/nutmeg/clove flavor. There actually isn’t any spice at all in the original cake recipe and I just added a little allspice here for some subtle warm, spicy flavor… but maybe more spice would suit your tastes better. 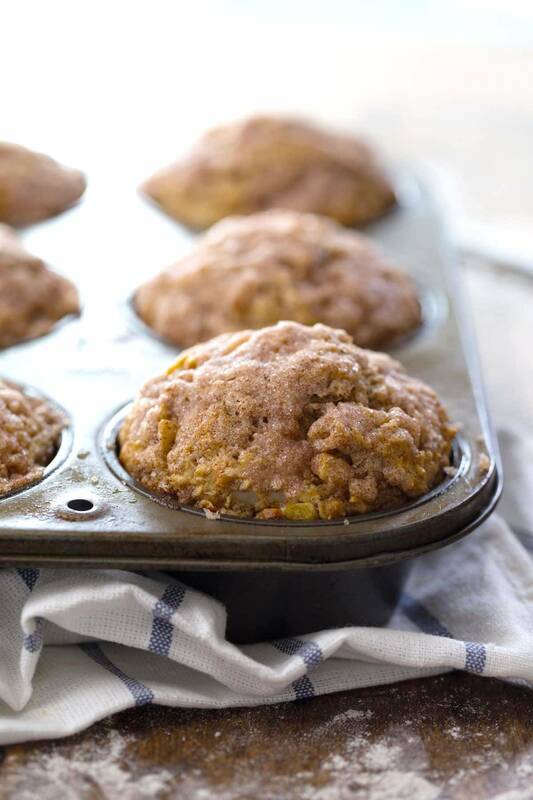 These muffins are what fall morning are made for! Good luck on your TV gig — you guys will do great! Best wishes for your TV segment tomorrow. You will do great.. plus you’ll have your hubby by your side! 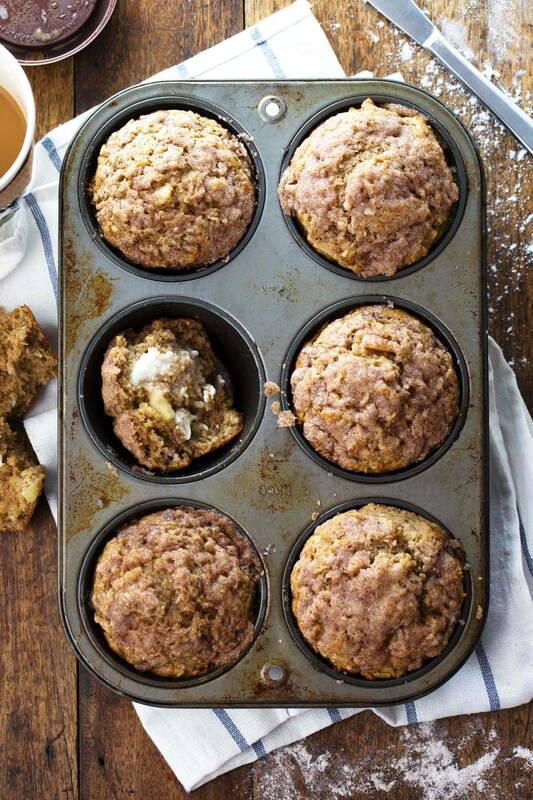 These muffins look Ahhhmazing! In the meantime, I will be stuffing my face with these fluffy cinnamony amazing apple muffins too! 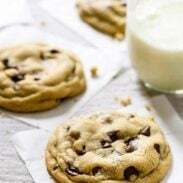 These look delicious! I feel for you and your nerves! My only experience on TV was in the 6th grade – and we need not talk about how long ago that has been! I was in a school choir dressed in a looooong red bandanna dress – UGH! I cringe just thinking of it!!!! Good luck! So perfect for a fifth grade debut on TV though! 🙂 hahaha! 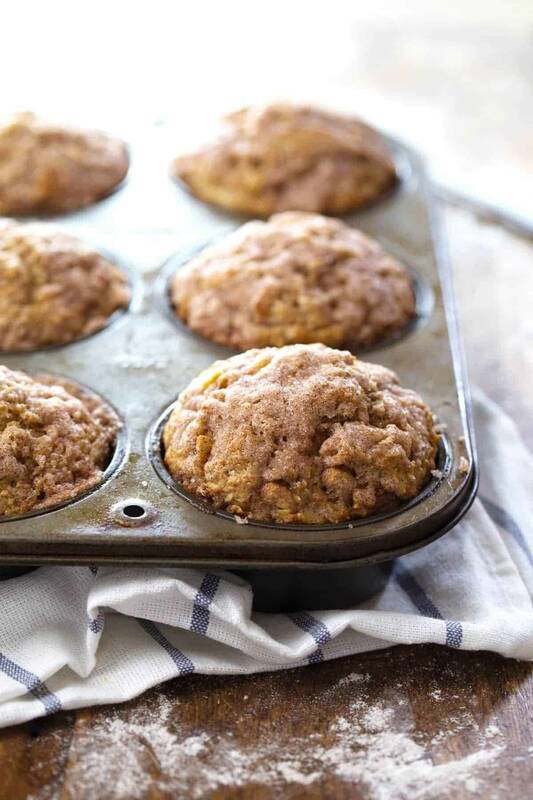 I felt like I could smell these muffins through the screen …. mmmm! All the best for the TV appearance … I would be sooo nervous as well, but remember it’s just one day. You’ll do great, and afterwards you can celebrate by eating more of these muffins! I might make these muffins, and pair with my spiked apple cider with Mediterranean twist;-) Better get to doing that! BTW were you at the Iowa State Fair? I didn’t see you there! LOL:-) I’m sure there are other state fairs, but ours in Des Moines is the largest. Hi Suzy! I was not at the Iowa State Fair but we do love the great MN get together every year! 🙂 Video link is in today’s post! Lindsay these look so delicious! I wish you lived close by so I can borrow these for breakfast!! This is so amazing! I can’t wait to make this for my family this weekend. Thank you for sharing. I can’t wait to go to the apple orchard later this month. These will be made immediately! We need all the healthy recipes we can get our hands on before the holidays hit….which will be soon! !